When a foster pup checks into Camp Chaos, or any foster home, a world of opportunity opens that otherwise would be unavailable. Take a look at the opportunities our Campers seized thanks to spending a little time at Camp Chaos. Send an update & photo to CampChaos37206@gmail.com to share your happy tale! 9 Puppies (3-11): March '07 found us at the dog park 7am on a Monday morning. As we had our coffee & watched our 3 girls run, a ne'er-do-well pulled into the parking lot, lost our attention, & then left 9 little puppies behind our car with a butter bowl of beans & cornbread. Not only were they puppies, which even the Grinch couldn't leave alone, but it was a record-breaking cold day. After making a call to the office to let them know I'd be late, Commander walked our dogs home & I drove home with a backseat full of shivering puppies. Nashville Humane took all for intake except 1, Fluff Bucket > Diego. Greta, Batman, & Yogi (above) were with us longer than the rest since we had to have 2 intake appointments. Greta would have become a furever pup if Georgie Girl wouldn't have joined us from animal control 2 weeks prior. Since then, we don't give large-breed puppies to NHA for fear that someone will adopt them only to have them become yard dogs. While it takes time, work, & money, it has been worth it to ensure that our little ones get their happily ever after. 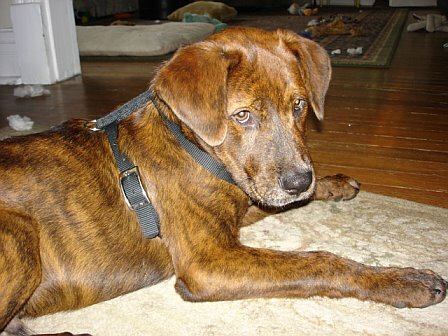 Waylon (12): June ‘07, we brought Waylon home from Shelby Park after he was let in the gate & no one would take him home. Friendly, passive, & housetrained, he became part of our pack. 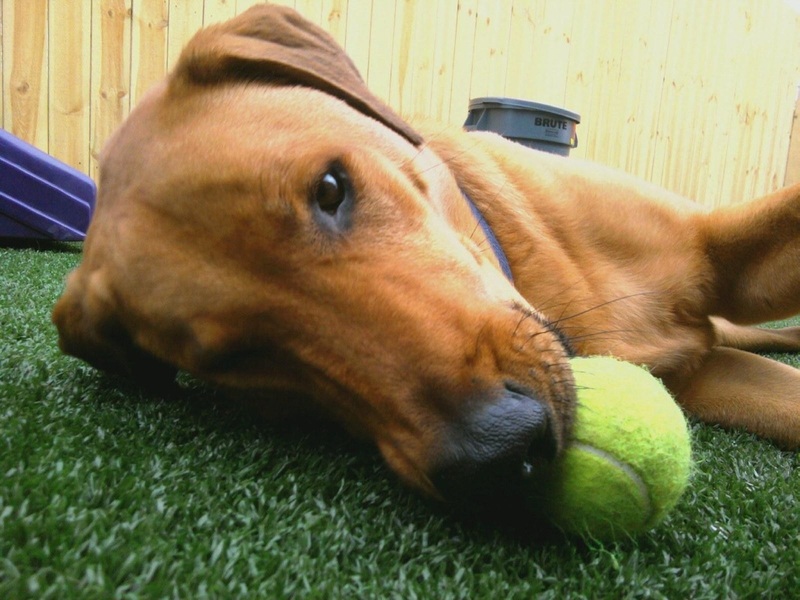 He found a terrific home in New England thanks to American Lab Rescue. He is a great brother to a poodle & multiple kitties, with the blind kitty being his best buddy. 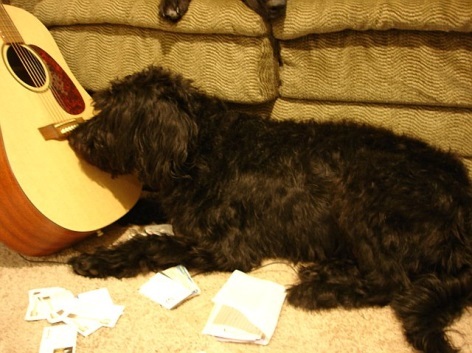 Lela>Gracie (13): Lela the Labradoodle was found by Nashville's animal control July 4th, '07. She & her brother were on I-40 when they were pinched & taken to doggie jail. He was adopted while she was left for weeks, posted as a boy named "Tom Seleck." 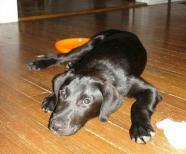 American Lab Rescue found her a great home in New England. Now called Gracie, she enjoys long walks, swimming in the ocean, & playing with the grandkids. Coal Porter (14): This is what happens when amateurs breed their newspaper-bought purebred to make extra money. Puppies get big without being sold, get zero training, & little socialization. Mom is typically on a chain or in a pen & puppies live outside. 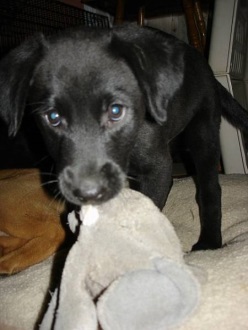 And American Lab Rescue saves such puppies! Coal spent some time with us then made his way to his home in New England. 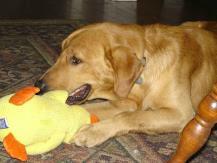 Chadwick (15): We fostered Chadwick for American Lab Rescue after they saved him from a high-kill shelter in Louisiana. He was our first experience with destroyed personal items, like Commander Chaos' work Blackberry. Fury filled the house, Chadwick went to doggie daycare, & we learned calming techniques. 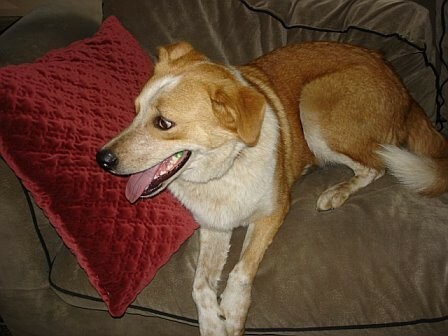 Chadwick came back home & it wasn’t long before ALR found him a perfect home. And we learned not to leave cell phones in the floor! 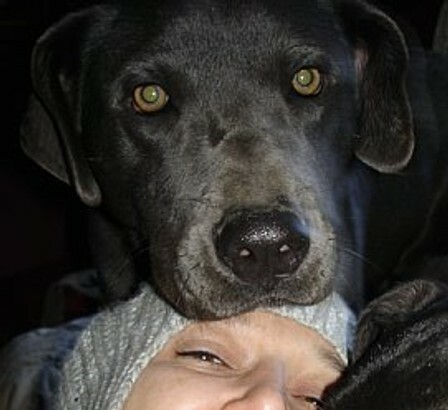 Carly > Daphney (16): Carly was in a high-kill Georgia shelter & American Lab Rescue said they would find her a home. I learned with this girl that many shelters, want dogs saved, but they use vets that charge exorbitant fees before letting them be pulled. I don't know how ALR still deals with me after the 'help' as a foster I have offered, but I am so grateful they do. 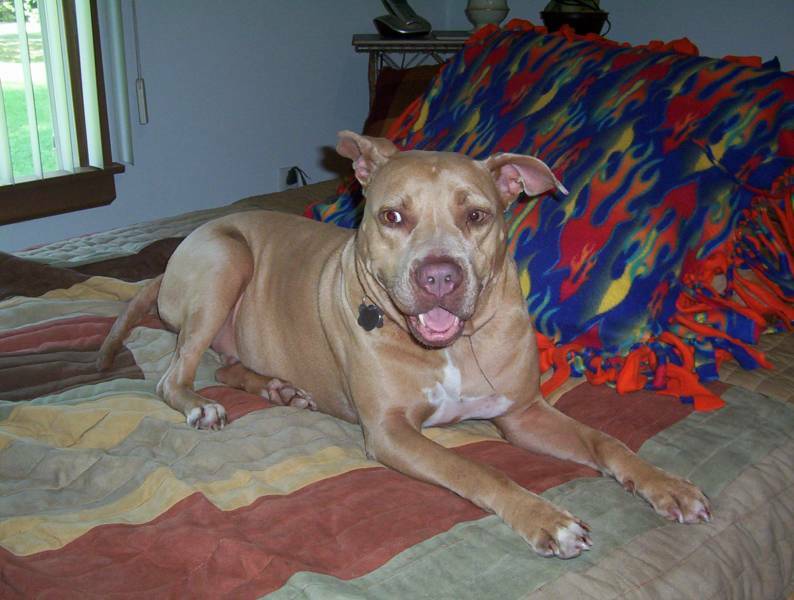 Now Miss Daphney, our sweet beauty has an awesome family who enjoys hiking & jogging! Turbo Dog (17): Someone I knew found out we took in strays. Then she asked us to take Turbo Dog. This kind young lady talked his first owner into surrendering him because he was left in his crate 10-14 hours/day. He loved free reign at Camp & his new playmates. Turbo stayed with us a week or two before becoming Inspector Dave's newest best friend & sidekick. Lady > Sadie (18): Lady was one of the many pregnant dogs on the streets. 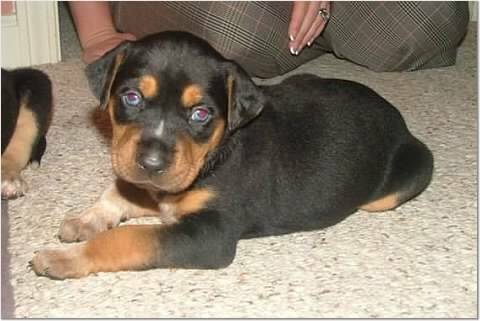 Camp Chaos was born Sept. '07 when we heard Lady was living under a house with her 4-week-old pups, Jack, RP, Mojo, Elvis, & Baby Pooh. Thanks to the ne'er-do-wells who allowed Lady's life to be challenged, Camp Chaos has helped 100+ puppy dogs. 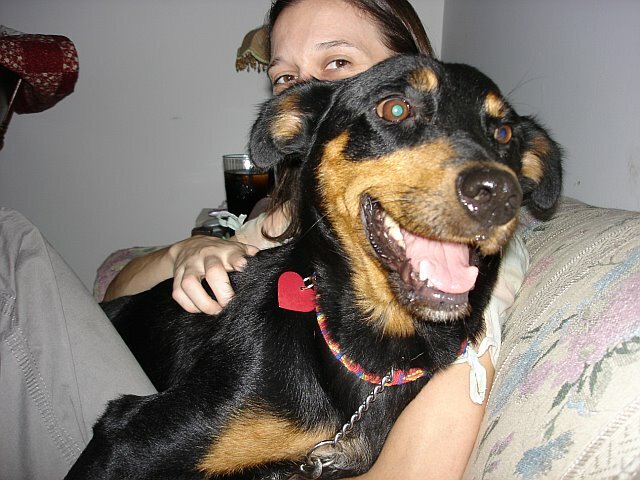 She was adopted March ’08 & her mom was her biggest fan & best friend until she passed away in ’12. Missy/Girlie>Baby Pooh (19): Missy was Commander's name for her, which I couldn't say due to braces, so I called her Girlie. Our vet tech decided her son & her boy dog needed a little girl. 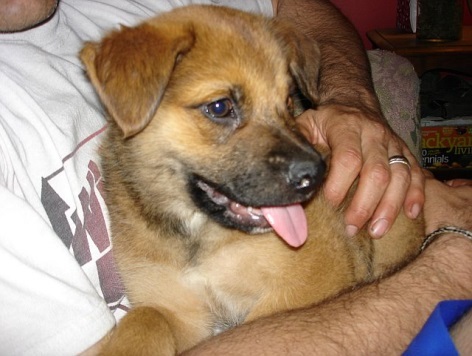 She was renamed Baby Pooh, & she was the littlest of the litter, weighing about 20 lbs. Elvis (20): Elvis was the runt of the litter. Sept 28, '07, he weighed 2.5 lbs at 4-5 weeks old. 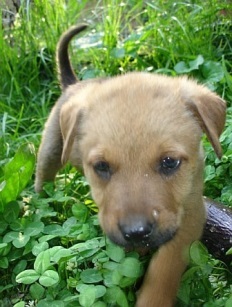 Elvis had ringworm, which is a fungus & not a worm, that prevented him from checking into Precious Friends Puppy Rescue. 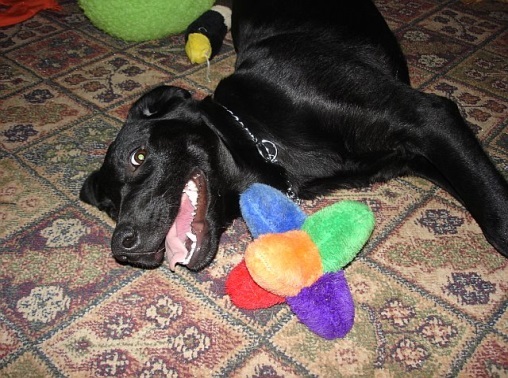 Elvis was adopted & lives in Connecticut thanks to American Lab Rescue. Mojo (21): Commander Chaos bonded with Mojo more so than his siblings, thus Mojo became a permanent Camper of Chaos. He spends his time either playing hard or lounging, there is no inbetween! Prince Mojo weighs 82 lbs & resembles a golden calf as much as a dog! Raleigh Petey>RP (22): RP checked into Camp along with his mama & siblings Sept. '07 at 5 weeks old. Ringworm kept him out of North Shore Animal League via Precious Friends. 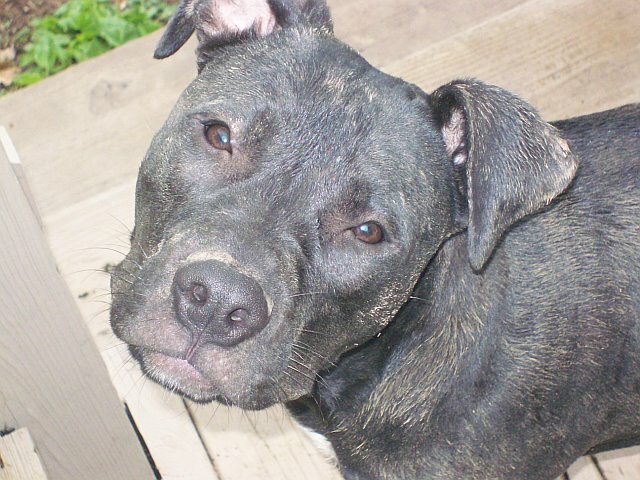 In Dec. '08, he was adopted by Roger & Erin who love him beyond belief. He returns to Camp with his little sister Baylee. 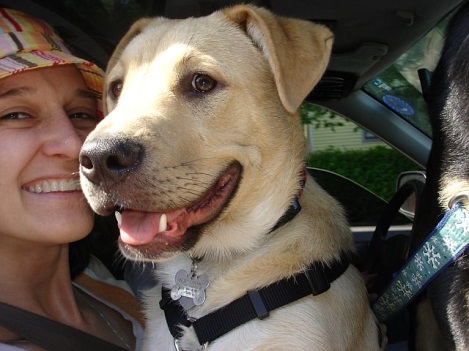 Rico>Jack (23): Jack, also Sadie's baby, was adopted by American Lab Rescue & lives with his very own little boy & wonderful family in CT. Jack grew to be huge, like Mojo, as well as sweet, & loving. 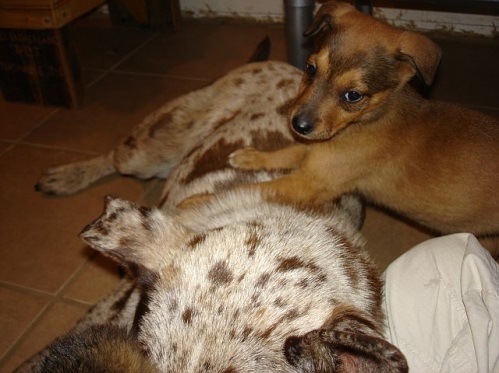 A Jack Russell mix puppy (24): One work day, we received a call from Turbo Dog's dad. He said there was a litter of puppies in North Nashville at an empty rental property. It took us a few days to get there and by that time, the owner had removed the puppies or called animal control, we're not sure which. As we were driving off, there was one little guy who appeared in the street. We had spoken to Nashville Humane Association who graciously said they could help if we found the litter. When we arrived at NHA with one little flea-ridden boy, they fortunately were able to take him. This isn't normal because they typically are so full, and we are so grateful they were able to help. 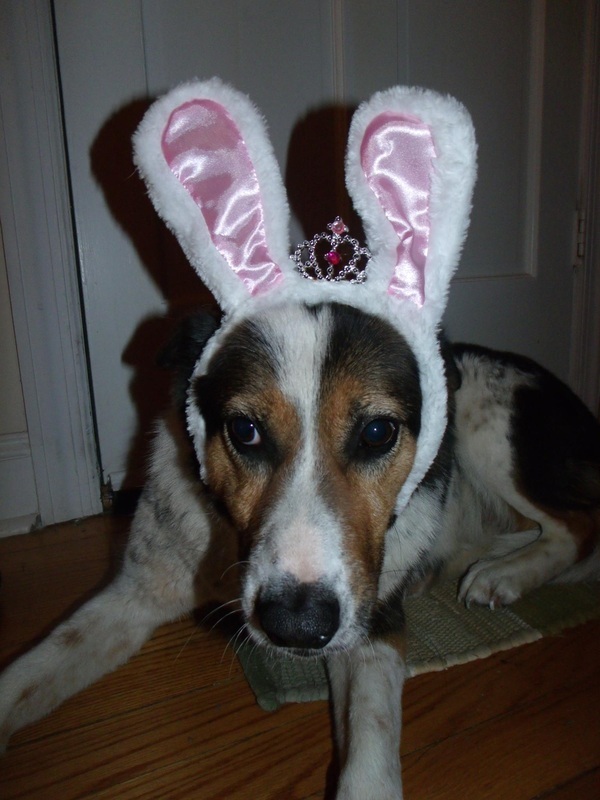 Sheba (25): My big bunny showed up as an emaciated stray with a massive mammary tumor Oct. '07. One of our 1st rescues, we had the help of St. Francis Animal Welfare Group with her vetting & Give A Dog A Home with socializing her. After 11 months at Camp, Sheebs was adopted. She's a great big sis to the many foster siblings her parents have saved from the streets since adopting her. Taco Bell (26): Nov '07 found me walking home from Shelby Dog Park with our 3 dogs to find a Manchester Terrier hanging out in the parking lot. Multiple people said he'd been trying to go home with people. My friend was also there; I begged him to take the Taco home since he only had 1 dog & we had 9 dogs. Despite my bribes, he said no; he simultaneously dropped many notches on my friend list. The little guy followed me home, & I made an emergency call to Kind Chaos. Taco found a fantastic home thanks to her. Sailor Boy (27): Sailor Boy was a stray from Davidson Street in East Nashville. We let a neighbor trap him in our yard to get him off the streets. Unfortunately that person couldn't keep him & neither could we being that he was the 13th dog at Camp & our numbers needed to be at 10. With East Nashville ListServ, a lovely lady reached out to help him. Thanks to her, he did not go to animal control where he surely would have been euthanized and this guy learned what it was to be a loved pet vs. a stray. 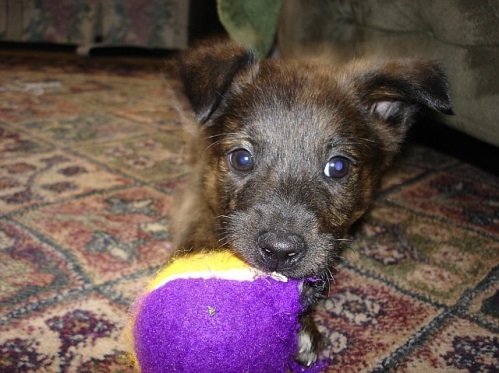 Bus-Stop Abe (28): Like his name implies, this terrier mix was found at the bus stop Jan ’07. While he was a delightful addition who really put the 'chaos' in our name, no one else was quite excited about his presence. Our pack hadn't embraced the idea of acceptance completely. Thanks to Kind Chaos who fostered with Happy Tales, Bus-Stop Abe checked out of Camp & ended up being adopted by his foster family. Mini Me Max > Frankie (29): Frankie was a refugee at Camp for a night. We already had too many dogs. I was sick. I took off work to figure out what I was going to do. I was grateful he was at least intake-able due to breed by Happy Tales or NHA. But I was even more grateful to hear someone calling for their lost dog Despite my gratitude, that person got a lecture on the importance of ID tags & how handy they are if he planned on coming home drunk & leaving open their gate. 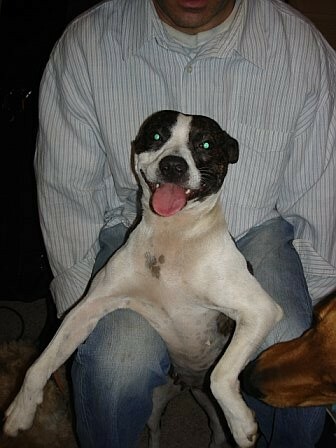 Trudy > Roxy (30): Feb '08, Roxy was rescued after being dumped at the Community Market on Trinity Lane & living there for 4+months. Thanks to donations from friends & personal credit cards, she received much-needed vaginal prolapse surgery, was spayed & vaccinated. Roxy was shy but eager to please. 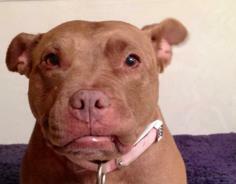 Her fosters worked with her getting in & out of cars, leashwalking, & wagging her bootie! Those same great friends adopted her. She has a sister, Clarice, as well as 2 sisters of the 2-legged sort! Pauly (31): My heart still breaks when I think of Pauly dog or see his photo. He & his brother Mickey have been our greatest success story, being caught in Feb '08 after living under a run-down, abandoned house at an age that made socializing hard. Even the trainer said they might not be able to become comfortable, social dogs. 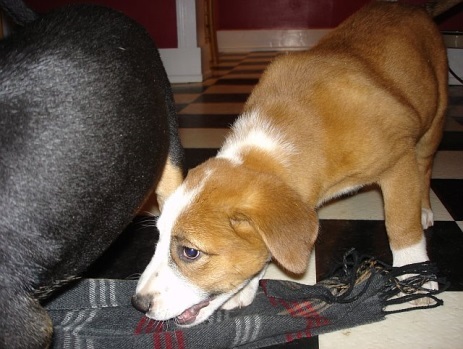 Pauly turned around quickly & was a perfect puppy thanks to our foster buddy. 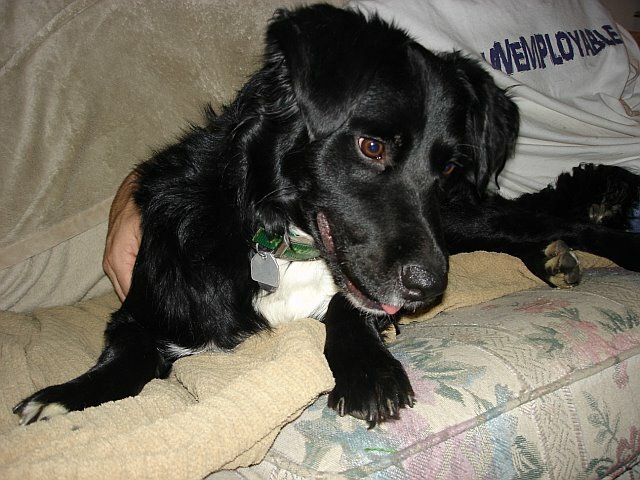 He was adopted June '08 & 2 weeks later after being left alone & not crated, he was killed by their adult dog. Despite instructions to crate for his safety & comfort, they did not. We cried for days over such an avoidable tragedy. Rest in peace, sweet boy. I am sorry your life was cut so short. Mickey (32): In Feb. '08, the Chaos Crew rescued Mickey. He lived under an abandoned home in East Nashville until then when he was 4 months old. After living at Camp for 3 months, he was adopted in July '08 by a motivated & dedicated young lady named Carolyn. With patience, love, & a jogging habit, she worked a miracle with him. It's always a treat when he comes to visit us. Micks settles in with his ol' family like he never left! He, to date, is a great success in terms of turning a feral pup into a loving companion, but we also realize having fewer dogs equals more time to give each dog & they become better socialized. One, Two, Three, & Four (33-36, left): This litter was graciously fostered by Kind Chaos' friend while they awaited their intake date with Precious Friends. Commander wouldn't allow me to name them since it would mean they may stay with us longer! Their fosters named them, Crocket, Tubbs, Maurice, & Ginger. 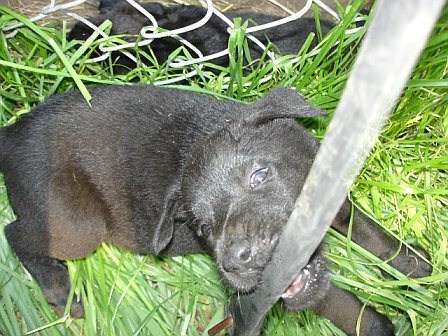 Not only were these pups saved, but the mama was spayed, vaccinated, wormed. 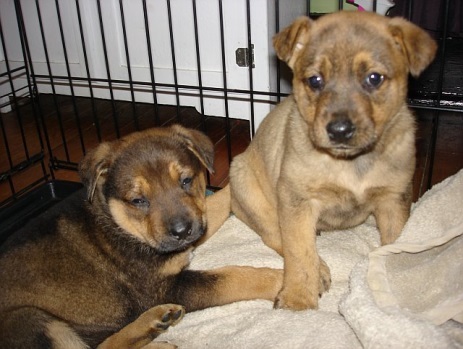 Black & Tan & Brownie (37 & 38): Camp Chaos didn't do much for these 2 pups other than connect Kind Chaos with Good People Feb '08, which is saying a lot because there are so few fosters for so many dogs in need. They were from different moms but saved by our friend simultaneously being that they were living at the same place. Brownie found a home through Happy Tales. 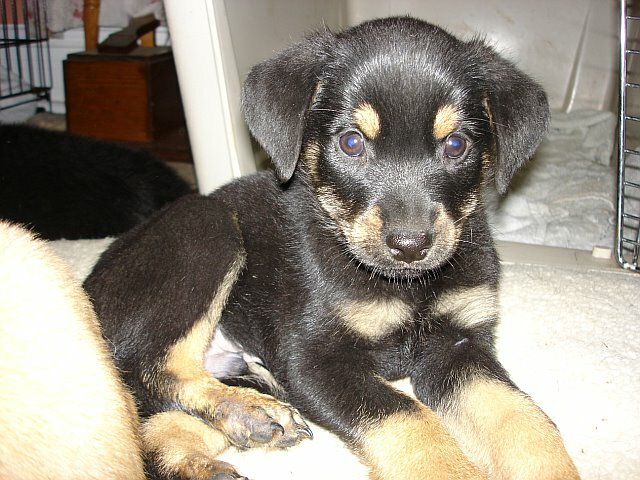 Black & Tan>Cassie was adopted by a friend. 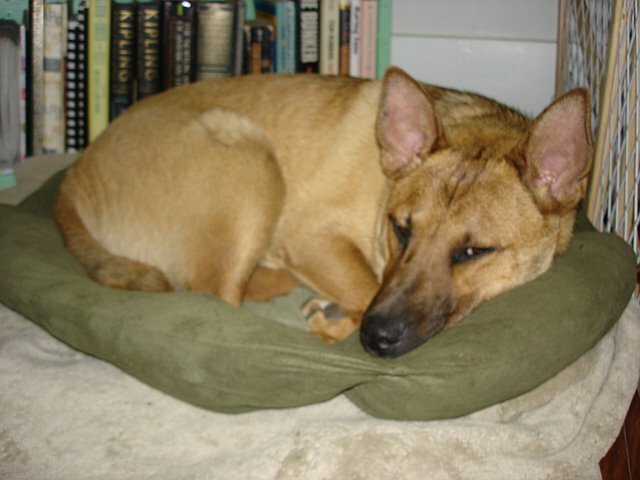 Dingo Dog (39): This little broken-tailed boy checked himself into Camp March '08. He politely came to our fence & patiently waited to be let in the gate so he could join the pack. We read on ENLS, he had lived on the streets a few weeks & was being fed. He had numerous cuts & bite wounds. 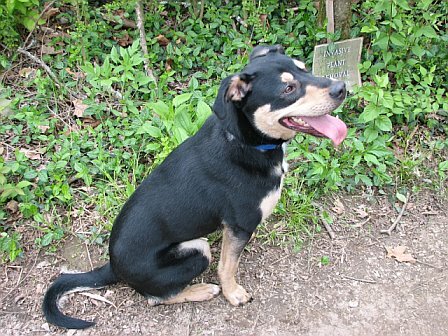 Dingo Dog was a most grateful & easy Camper, getting vetted, neutered, & ready for adoption. 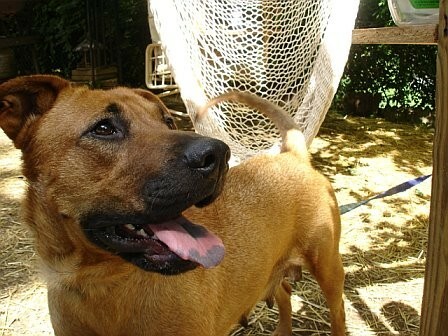 Dingo was adopted May '08 by a lovely lady looking for a buddy for her & her lab. Bobby McGee (40): Commander Chaos & I were helping a rescue search for an abandoned Beagle March '08 & came upon this fluff bucket. The sweet elderly man said he was going to keep him for himself, which unfortunately equaled a chain & dog house beside 3 more dogs. While we in no way needed to bring him home, I ooh'ed & aah'ed over the puppy until the man let me have him. Another special thanks goes out to Kind Chaos who fostered him & worked to find him a great family through Happy Tales April '08. 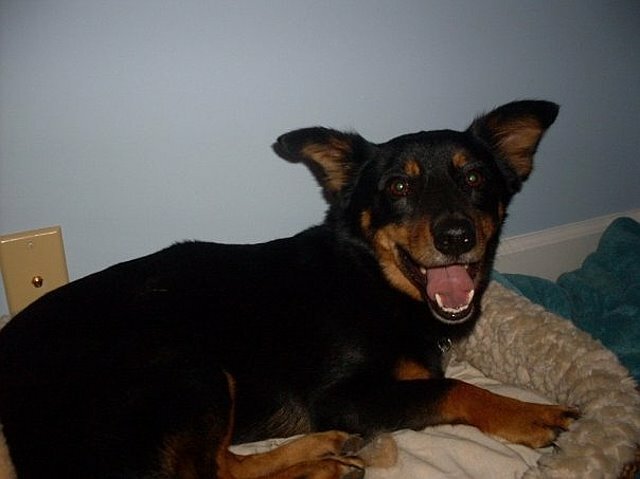 Lila (41): There was a fluffy black girl living in Shelby Park for a few weeks in April '08 per some dog-walking friends. Someone was putting kibble out & a bowl of water, but she wouldn't allow people to catch her. Finally she was wrangled into our backyard where we could touch her. Lila got a bath, some food & love, & an appointment to Nashville Humane Association. Unfortunately we had too many dogs & there were no foster homes to keep her until we could get her spayed & adopted. We do know that she got adopted quickly after hitting NHA's adoption floor later in April. 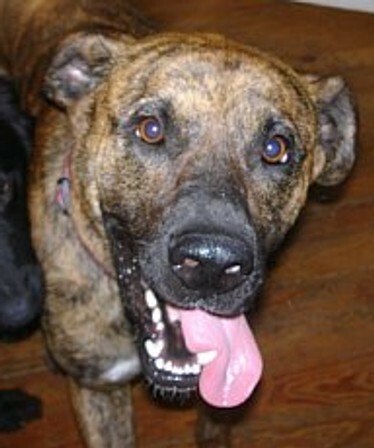 Buster Brown (44): A friend of Camp Chaos came along this buddy May '08 & Kind Chaos was able to foster him. American Lab Rescue came to the rescue quickly! Before we knew it there was an approved application followed by a great home visit. Buster Brown was getting a golden ticket to a great home. Buster went from living a scary life on the streets of Nashville to living with a mom & her young son in New England the last day of May '08. 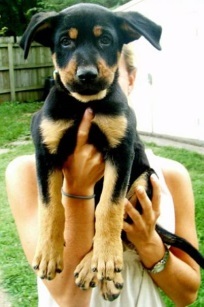 Lil Shylee > Scout (45): Commander Chaos was sent on a mission the end of May '08 to save 2 puppies from Whites Creek Pike. Our friend who came to help showed up with this little girl who she had found on the way. Being the suckers that we are, we brought her home, too, being that the other option was the friend taking her to animal control. 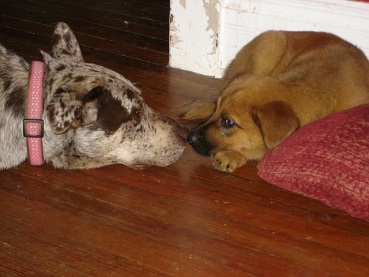 She spent a few days with us but she, too, was going to have to go to Nashville Humane due to our huge number of dogs. A foster buddy helped us, she was adopted by their neighbor, & now lives in Los Angeles. 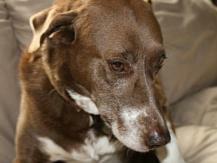 Party Girl > Tessa (46): Party Girl came from Whites Creek Pike May '08. She & her sister Cheeky Monkey>Patticake were the last 2 of a large litter born to a feral mom. She was adopted quickly by a great little family & named Tessa. Oddly enough, Tessa was returned to us the first week, then she was taken back by the family the very next day. I guess absence made the heart realize how much they loved her. While her timidity was the issue, they decided she was worth the time & work. Cheeky Monkey > Patticake (47): On May 22, 2008, the story of Patticake began with the name of Cheeky Monkey. We had a couple of friends who fostered her, but it didn't work. She was afraid of everyone. While we didn't have the time to devote to get her socialized, it beat the alternative (euthanasia). 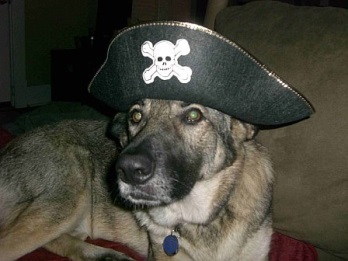 In Oct '09, she was adopted in New England. Despite their desires, no training, no leash walks left her scared & uncomfortable. She was returned. She returned as an adult feral dog that pooped on herself when we touched her. On the bright side, she was so happy the second she arrived at Camp! She kissed all of her old pals & wagged her whole body. She got a new lease on life with leash walks, playing catch, & learning to be touched again. 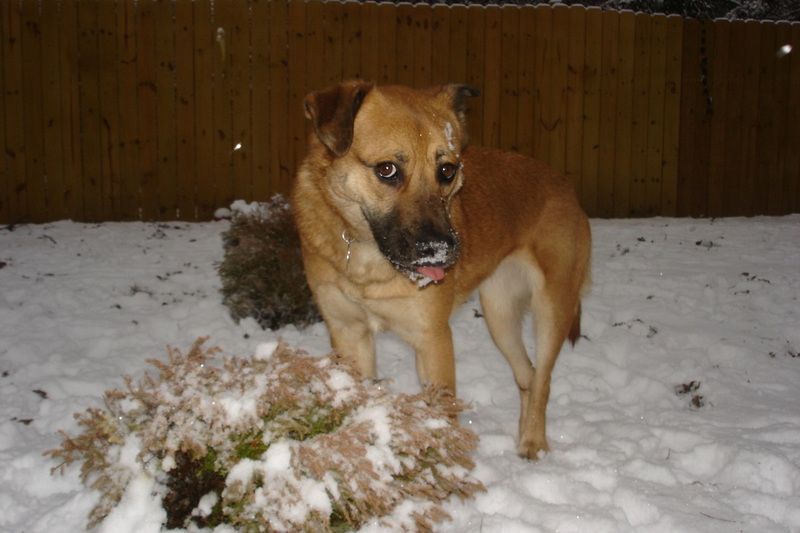 In Dec '09, Patticake learned a new trick: jumping the backyard fence. She was hit by a car & spent 3 weeks with the vet. The forced socialization throughout the day got her over the feral hump. For years, Commander Chaos called her our furever foster, and we are living happily ever after! Jack the Giant (48): Poor Jack was so big at 10 months old that no one would take him in. When we found him, he had been spreading his oats on Woodland St. while being fed by the neighbors. 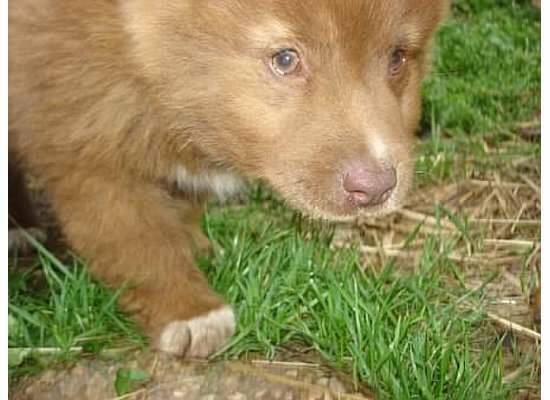 We weren't equipped to bring him home considering we had just taken in 3 semiferal puppies, Beauty & her 10 puppies, not to mention our own dogs, but we couldn't leave him on the streets any longer. Southern States Mastiff Rescue found a foster for him who decided they would take him to animal control because he wasn't a purebred mastiff. SSMR worked for days before finally they could get him out of A/C. I almost had a heart attack when I heard this part of his story after the fact, but the ending was happy. 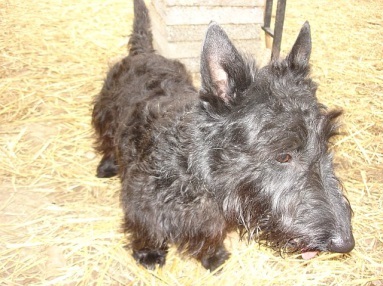 SSMR miraculously found him a wonderful family who were eager for a big dog like Jack. Beauty & her 10 Puppies (49-59): Beauty had 10 pups in an abandoned garage off Lischey Ave. We picked them up as soon as we heard about them & they moved to Camp where they lived in an safe, warm outdoor area. We found foster homes after a week of searching. Of her puppies, 6 went to North Shore Animal League via Precous Friends. The remaining 4, were named Dempsey, Delta, Darby, & Dash & were fostered by Kind Chaos & adopted through Happy Tales.